It was the university’s innovative approach to technology that originally drew Zach Higgins (’13) to enroll at ACU. But it was his experience with faculty in the School of Information Technology and Computing that made him realize he was in the right place. While at ACU, Zach served an internship with insurance giant USAA, a company with a strong track record of hiring COBA grads. Now, he works as a software developer and integrator for the company and believes his ACU experience set him up for success. 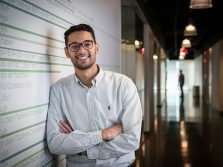 “Everything I learned from my core professors in SITC was immediately applicable to the business world,” he says. View more from Barrett Lewis.